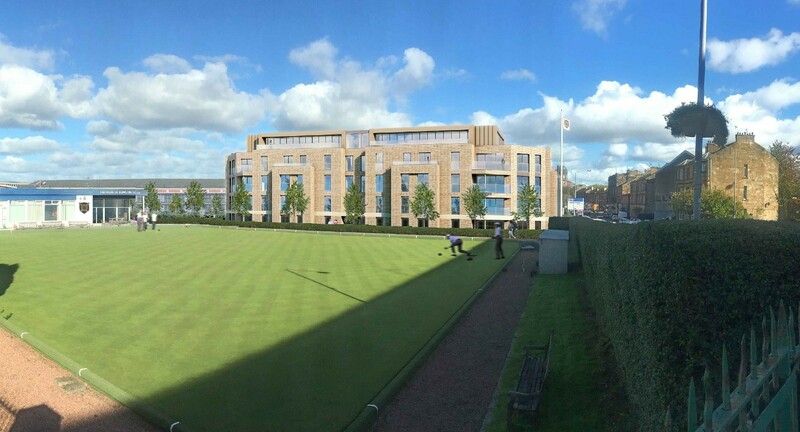 Shawlands Bowling Club has been earmarked for residential expansion with an application by Kelvin Properties to erect a block of flats on the site of a disused green. 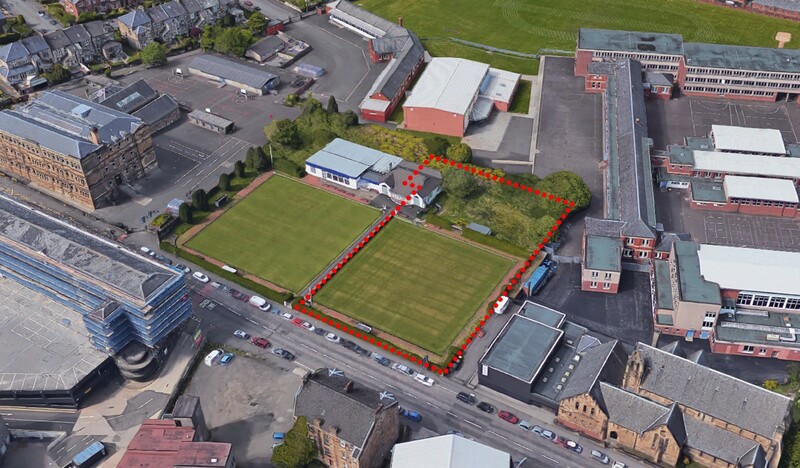 Holmes Miller Architects have been appointed to lead the design of the proposal which will necessitate demolition of a portion of the current clubhouse, the remainder of which will be refurbished. 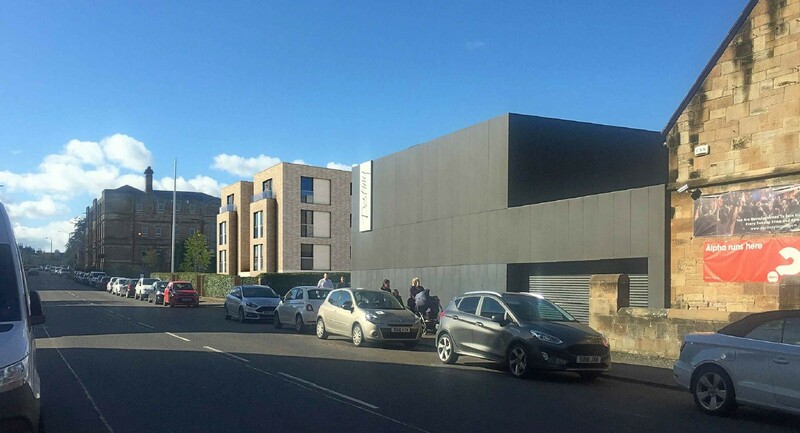 Located off Pollokshaws Road and bordering a retained bowling green to the west the scheme would deliver 51 flats with higher level properties benefitting from private balconies and terraces. 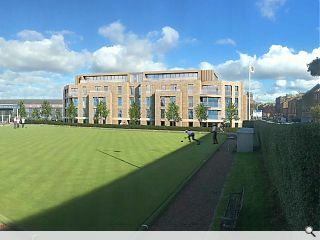 In a statement the architects wrote: “The design has been developed to maximise aspects (to the bowling green) with the use of terraces and full height windows with juliet balconies. 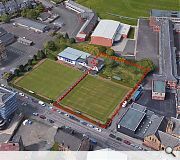 Shawlands is one of a number of bowling clubs across the city to have been lined up for development amidst dwindling memberships, most recently at Cathcart. Strange beast -- seems to focus on the bowling green rather than the street. Has some presence and scale but it looks as if it has beamed in from Finnieston. Design vibe seems to be a mix of MI6 and Mumsnet. File under filler in a very poor street. The church hall next door must have relied on divine intervention to get through planning -- shocking. 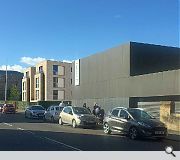 The proposal fronts the bowling green because the site is a RECTANGLE perpendicular to Pollokshaws Road. 'The church hall' you refer to is Destiny Church designed by Nord Architects and is what is referred to in simple planning terms as taking a minimalist 'contrasting' approach to the existing Victorian church. Hopefully, you just might find these clips instructive. Church -- visual pollution no matter who designed it. I wonder how the Victorians dealt with rectangular sites? No matter the scale is overbearing / overbuilt. Profits before people would be a good place to start. The scale of the proposal relates well to its context. I welcome this development. I like the simplistic brick with the gold cladding above. Those south-facing penthouses will be cracking….if only I could afford one. A lot of Bowling Clubs in Glasgow seem to be taking this approach and teaming up with developers. To me it makes perfect sense to utilise this unused ground, and it is good that the club is safeguarding their future, unlike Corunna Bowling Club which has completely shut up shop in pursuit of the Queen’s Head. Regarding the building design, I think it will be a positive addition to a stretch of road that has some real shockers, Destiny Church not included. The monstrosity across the road is an eyesore. Due to the orientation of the site it makes complete sense to have the main frontage onto the bowling green, which will also be south facing. I would however have liked the building to have been slightly closer to Pollokshaws Road. All in all a solid effort. Well done Holmes Miller. Get another couple of storeys on this.